IDF forces fire at infiltrator; Lebanon claims one soldier wounded in clashes. Israeli and Lebanese forces clashed along the northern border Sunday afternoon, according to Lebanese media sources. Unnamed security sources claimed that one Lebanese soldier was injured in the brief gunbattle, which took place close to the Har Dov (Shabaa Farms) area. 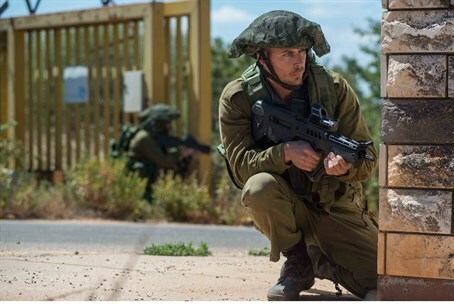 The IDF said troops had opened fire on suspects trying to infiltrate the north of the country. "Earlier today, during a routine activity along the Israel-Lebanon border, an IDF (army) force identified suspects crossing the border and infiltrating into Israeli territory," the army said in a statement. "The force responded by opening fire towards the suspects, who escaped north, returning to Lebanon. The incident is currently being reviewed." A Lebanese army source told AFP the Lebanese soldier was hit when an army patrol came under fire in Jabal Sadanneh, west of Har Dov. The border has been the scene of periodic clashes between Lebanese and Israeli forces along the so-called "Blue Line" drawn up by the UN when Israel withdrew from southern Lebanon in 2000. Last year IDF Master Sergeant Shlomi Cohen was shot dead by a rogue Lebanese soldier, who later handed himself in after a brief period on the run. It is not clear if the wounded soldier was the suspected infiltrator.